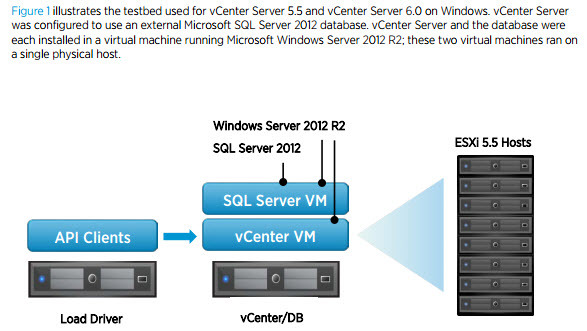 Few weeks back VMware has released a new paper detailing vCenter Server 6.0 Performance Best Practices. Also the PDF talks about the performance improvements of vCenter server 6 over vCenter server 5.5. The authors are Mike Stunes and Ravi Soundararajan from VMware. Differences in type of deployment platform (Windows or Linux) are compared too. What’s New in vCenter Server 6? VMware vCenter Server Appliance now has the same scale limits as vCenter Server on Windows with an external database: 1,000 ESXi hosts, 10,000 powered-on virtual machines, and 15,000 registered virtual machines. VMware vSphere Web Client performance has improved (still not good enough IMHO, and still flash based!! ), with certain pages over 90% faster. This paper demonstrates the improved performance in vCenter Server 6.0 compared to vCenter Server 5.5, and shows that vCenter Server with the embedded vPostgres database now performs as well as vCenter Server with an external database, even at vCenter Server’s scale limits. This paper also discusses factors that affect vCenter Server performance and provides best practices for vCenter Server performance. Windows vCenter installation experience has been enhanced with additional capabilities including custom ports, custom paths, uninstall and error messaging improvements. Furthermore, all upgrade paths from Windows vCenter 5.0 and up are now supported. vCenter Server Appliance (vCSA) now has a guided installer. Separate ISOs and scripted installation for both vCenter Server for Windows and vCSA reduce the overall download time and improve automation capabilities respectively. New Platform Service Controller (for both platforms) – This is completely new component which is called Platform Services Controller, which can be plugged into other PSCs for HA or replication purposes. The PSC contains all the necessary services that vCenter needs for its functions. There is a Single Sign-On (SSO) , licensing service or certificate management service. The embedded PSC is meant to be used for standalone sites where vCenter server will be the only SSO integrated solution. In this case a replication to another PSC is not necessary. External PSC shall be deployed in environments where there is more then one SSO enabled solution (vCenter Server, vRealize Automation, etc…) OR where replication to another PSC (another site) is necessary.